It was a very bad day led to other worse following days for people who drove cars passing through China National Highway 110 on 14th August 2010. A massive traffic jam had occurred that day and lasted for more than 10 days. With 100 km (60 miles) of traffic length, it was real hopeless days for those drivers, especially those who were trapped and stuck in the middle of the traffic for up to 5 days. 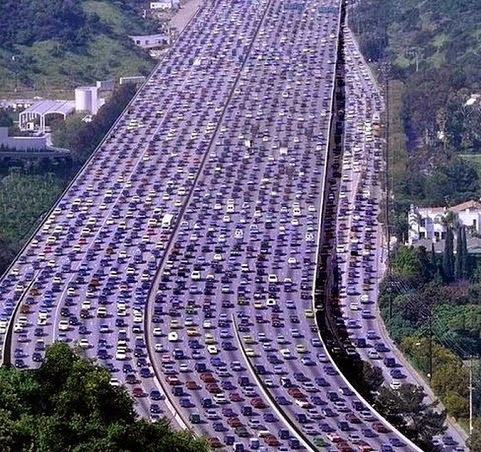 An aerial view of massive traffic jam in China. The traffic jam was caused by highway maintenance that reduced 50% of regular road capacity, and rapid amount of lorries which were travelling to Beijing. It was a really good opportunity for locals who lived nearby as they sold foods like instant noodles and biscuits for 3 to 5 times more expensive than normal prices. No response yet to "FACT: The longest traffic jam was occurred in China, stretching for about 100 km and leaving drivers stuck in traffic for 5 days"